Spring not exactly busting out all over – as yet! There’s a real feeling today of Spring being held back by this cold and literally blasted weather. A real seasonal tension being played out here on the lawns of the Macdonald Bath Spa Hotel. In Pulteney Street l saw a woman clutching a little pot of sunshine, between her hands, to take home and brighten her grey day. Tiny narcissus bulbs with flowers glowing yellow on this dark and winter-gripped day. Enough poetics. While l was there l noticed someone had carved initials above the house number over the front door at number 48. Who or what was ‘B.C.’ l wonder? The muddy way in to the Holburne Museum from Sydney Gardens. Have to say l wonder why the Holburne Museum continues to keep its gate into Sydney Gardens unlocked. The entrance to the museum’s grounds is an almost impassable giant patch of mud. 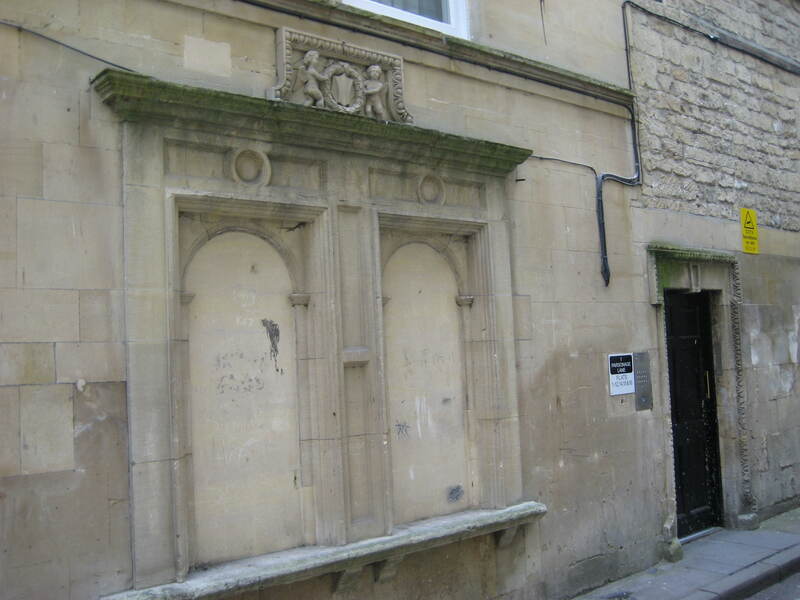 The ornate windows and doorway in Parsonage Lane. 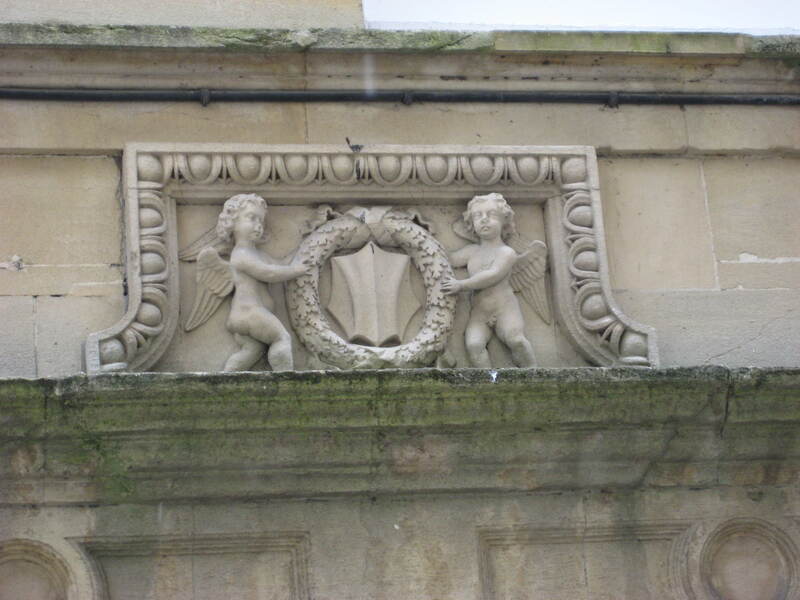 Walking down Cheap Street – which means market by the way – l glanced into Parsonage Lane and noticed – for the first time ever – a beautifully carved window and doorway with two cherubs holding up a wreath above on the left hand side of this narrow street. An architectural mixture of classical and baroque. Does anyone know its history? A closer view of the cherubs! Heading up Lansdown Hill another example of faded Victorian street advertising. What exactly was the Old Red House? This building on River’s Street is not that colour, but it does seem to have been the local branch of a business established in 1798! Another puzzle that – hopefully – someone can help me with. ny different artist friends. I often used to sit on a genuine Peter Blake. Thanks for that George. A mind full of useful information! Not everyone gets to sit on Peter Blake!